~ " My Food Journey "
So it was super late the other night, Sunday to be exact, when I decided that I was going to tackle dinner at any cost. Not that it was anything that unusual for me as you all know me to be a night owl any way, but the idea of eating what I at least perceive to be a heavy meal at 1 AM, can be off putting to most. Well this time I can say not me! I was happy I went to work on this meal and even found the mustard to shoot pictures of the process and put together a small shoot of the effort. It was delicious and well worth every grain of Maldon sea salt I used to prep (season) and finish this dish. I had a simple but delicious side of roasted Russet potatoes and patty pan squash, that I tossed with Greek olive oil, kosher salt and freshly ground black pepper and a few sprigs of thyme. You really don’t need much more than that. It’s the perfect meal! 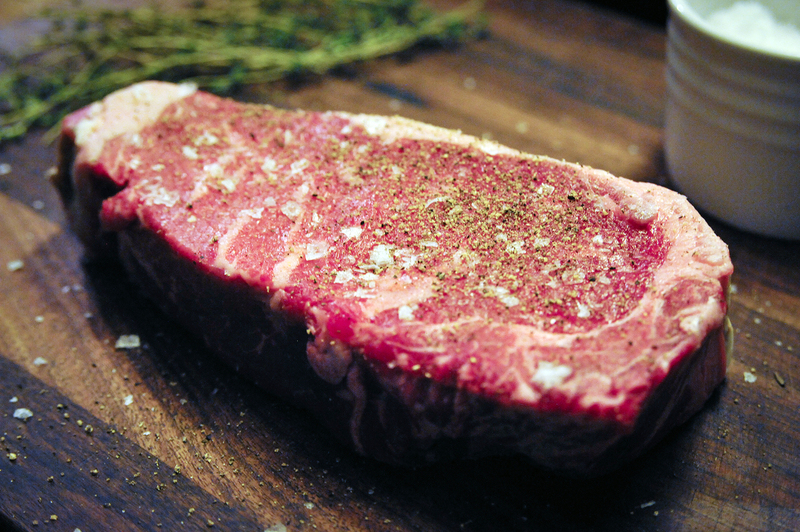 Organic Grass Fed Piedmontese Beef is uniquely lean and tender. The Piedmontese breed originated 25,000 years ago in the foothills of the Italian Alps where the cattle grazed on a natural diet of fiber-rich grasses. Their lean physique and heavier muscle structure (known as double muscle) produces a more tender, juicy and full flavored beef that has less fat, calories and lower cholesterol than chicken, not to mention traditional beef. Preheat your oven to 400 degrees. Season the strip on both sides with plenty of salt and pepper, being sure to press the salt and pepper into the meat. Drizzle with olive oil. *Do not cook the steak until it has had time to temper (Rest) at room temperature for at least 30 minutes if it has just been removed from the refrigerator. Also only season the steak just before cooking. This steak does not need marination. Once seasoned, heat up your skillet and allow to get super hot. Drizzle some olive oil, canola or vegetable oil (about 2 table spoons) into the skillet. 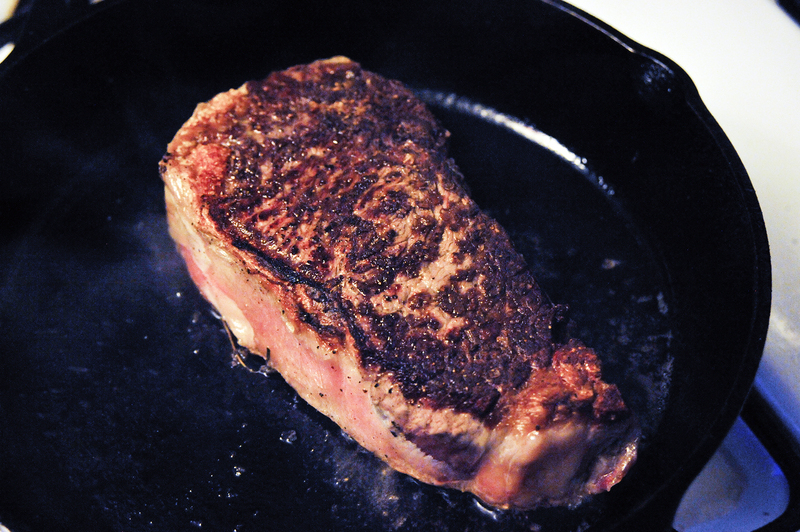 Once heated place your steak into the skillet to sear. Do not move the steak or play with it. Leave it to cook and develop a crust: In about 3 minutes turn the steak to the other side and allow the same. You want a good crust to develop equally on both sides of the strip. Add the butter to the skillet along with the thyme. Tilt the pan toward you holding the handle with a folded kitchen towel and with a table spoon baste the steak with the butter to coat the steak. 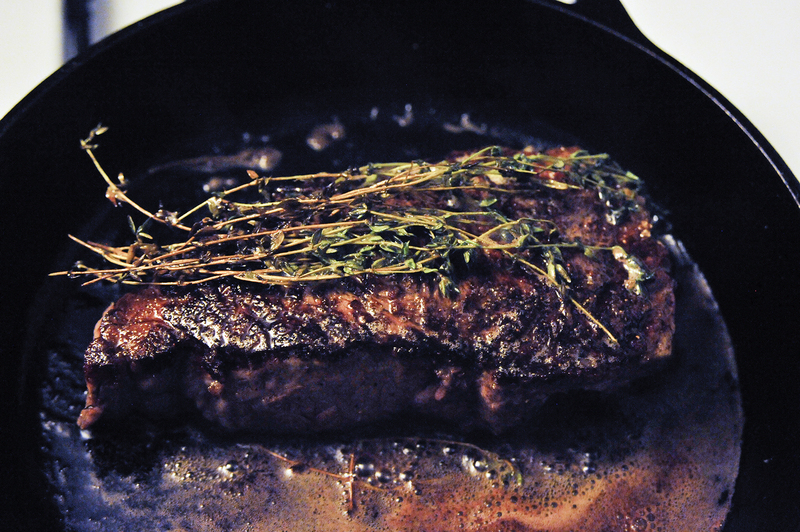 Keep spooning the strip with the butter to develop flavor from both the thyme and butter, about 1 minute. Place the skillet into the hot oven and continue to cook for another 4-5 minutes for medium-rare or 6-7 minutes for medium. An internal temperature of 130-135 degrees Fahrenheit is what you’re looking for if medium-rare is your preferred temp as it is mine. In one of the photos you can see that a cake tester was used to test for medium-rare. A cake tester is the preferred tool by most grill or broiler chefs in high end restaurants. 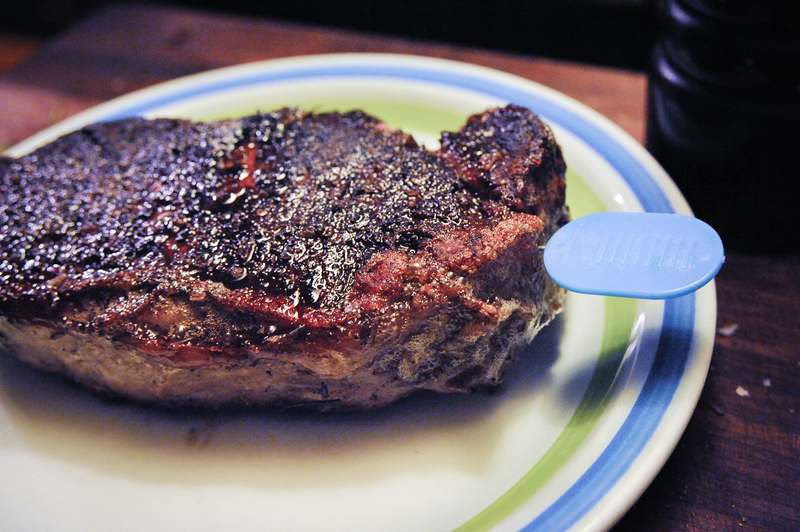 Medium is fine too (140-145), but this quality steak should not be cooked beyond that. Also a small cooling rack was used as this keeps the steak from sitting in its juices and destroying that amazing crust you worked so hard to develop. Anything other would be a crime. 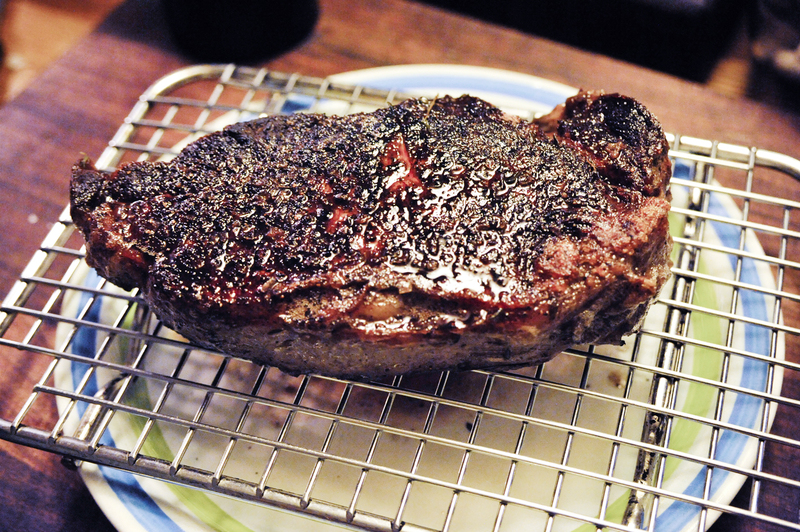 Remove the steak from the oven and place the steak on a small cooling rack or plate to rest for at least 10 minutes. 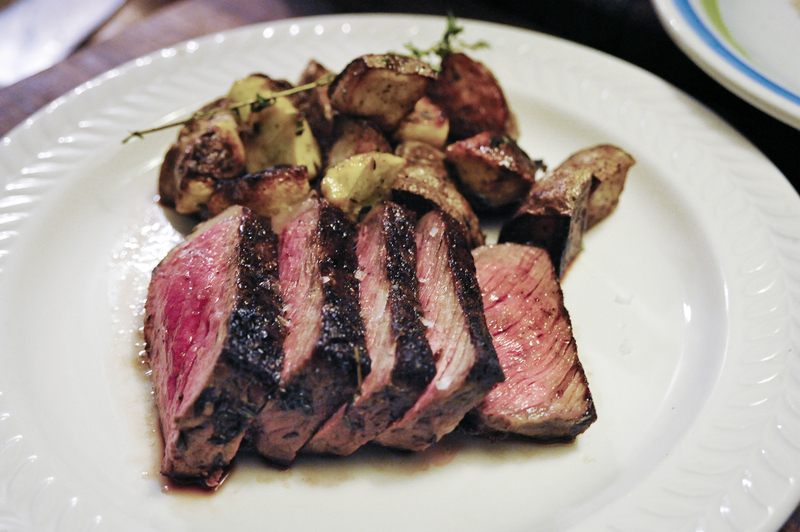 Do not cut into the steak before or it will bleed and dry out and become chewy. And always slice against the grain. You must resist all urges to cut into the steak before it has had time to rest trust me. 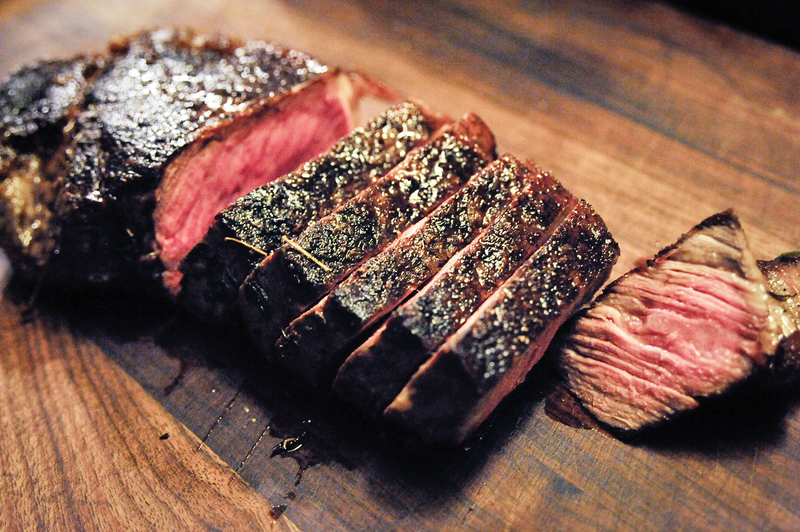 Once rested, place the steak on a cutting board and slice the steak into 3/8th to half inch slices. Finish with Maldon’s just before serving and placed on the serving plate for that extra bit of flavor and crunchy finish. 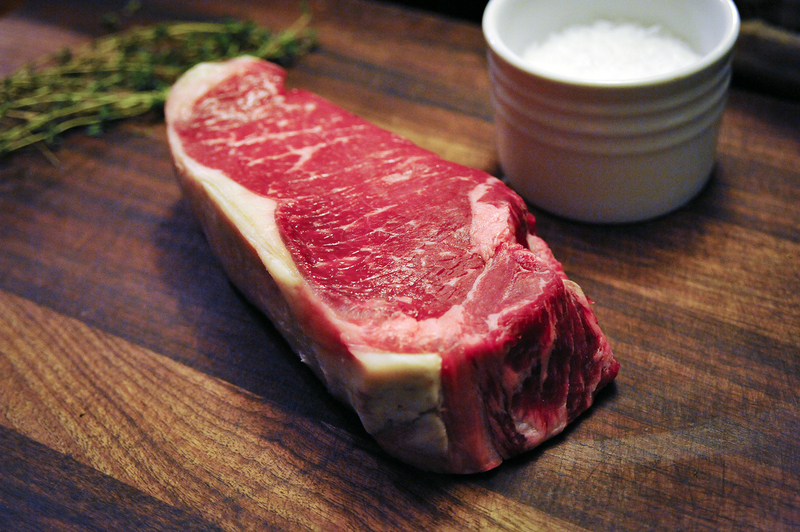 Piedmontese Strip purchased @ NY’s Eataly butcher counter. Note: Cake tester use. Place the tester into the meat once pulled from the oven as shown, for about 1 minute. Remove the tester and place the metal lengthwise just below your bottom lip and feel for heat. 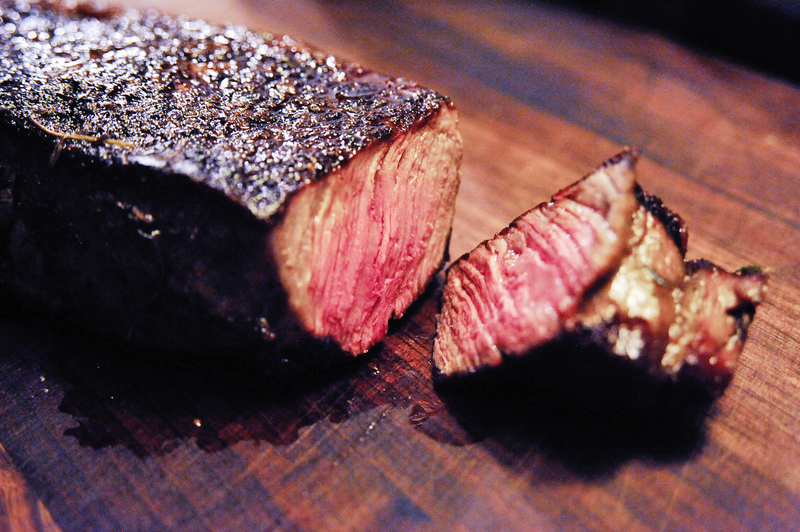 If hot but not scorching, it is a perfect medium-rare. 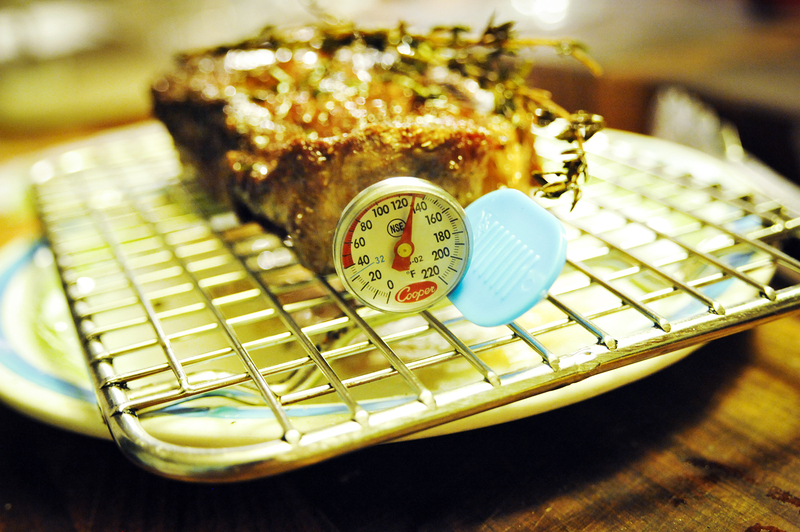 Also, a meat thermometer can be used for a more accurate reading. An initial temperature of 125-130 should be seen, as the carry-over-heat, will continue to cook the meat to a perfect medium rare, if done properly. Enjoy!